On Oct. 21, 1979 Jimmy Carter allowed the deposed Shah Mohammed Reza Pahlavi of Iran to enter the U.S. to receive medical treatment for cancer. This humanitarian action towards a single immigrant exacerbated tensions with Iran’s new revolutionary government, led by Ayotollah Ruhollah Khomeini. On Nov. 4, a group of students and others inspired by Khomeini stormed the U.S. embassy in Tehran, taking dozens of hostages. The first Iranian to become a U.S. citizen was Mirza Mohammad Ali (also known as Hajj Sayyah), in 1875. Hajj Sayah was a world traveller who lived in the U.S. for a decade, and met with President U.S. Grant on several occasions. 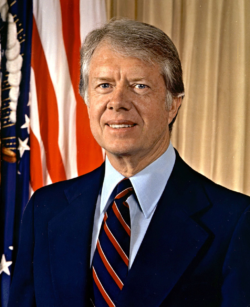 At the time of Carter’s sanctions, there were more than 50,000 Iranians in the U.S. on student visas. According to U.S. census figures there were 123,000 people of Iranian ancestry in the U.S. in 1980.